Looking for a way to sneak in some extra calcium, protein, or veggies in your kid’s diet? Check out these 17 Kid Friendly Smoothie Recipes. Some days we’re in too much of a rush to create a well balanced, nutritious, and delicious breakfast before heading out the door. It’s sad, but true. It’s not just for my kids, it’s also for my husband and myself. And even more so now that we’re both working out and our schedule has begun to fill up even more with other activities. But the smoothie, the smoothie is a genius creation. You can throw in fruit, veggies, and protein and make a tasty yet nutritious “milkshake” for the kids to enjoy before school. Any way I can find to add one more serving of fruits or veggies into my kid’s diets is a win in my book. My usual go to recipe for my girls (and myself) is a combination of strawberries, bananas, spinach, and low fat milk. But the recipes I collected on Foodie.com mix things up and allow my girls a little variety in their breakfast smoothies. 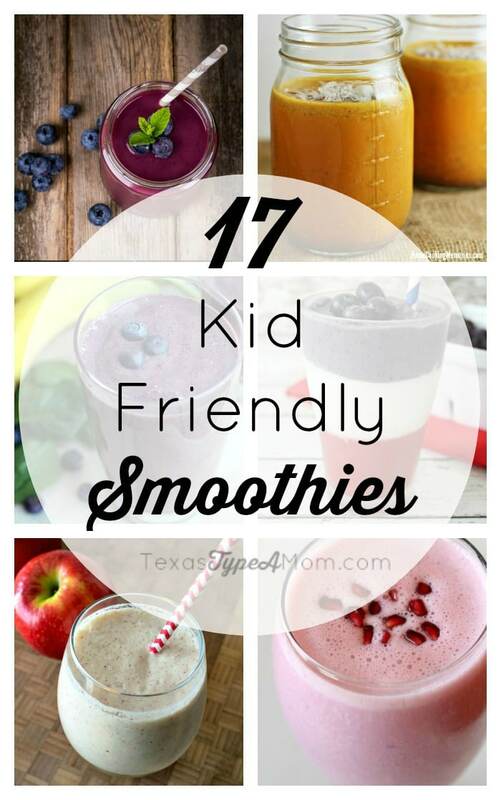 Check out these 17 Kid Friendly Smoothie Recipes! What are your favorite kid friendly smoothie recipes? I would love to share this article on my FB page: Chatterhood – a page for busy parents to find kid-friendly resources. Please let me know if you approve and what type of credit you would like when I link to it. My husband has been on a smoothie kick. I’ve experimented with many different things but he prefers my plain ‘ol strawberr. I’ll have to try some of these on him!